You don’t need to visit the gym to get fit. Try these exercises at home! Our fitness goals often get back-burnered due to life’s everyday demands. 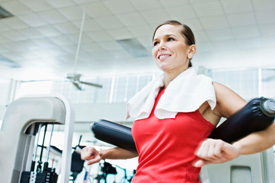 It’s time to put getting healthy and fit on the front burner so you can be the best you. Our often jam-packed schedules may only allow for 20 minutes of our own time for fitness. Make those precious minutes count by including a strength component as part of your fitness regimen. Push-ups: You can either do a push-up on the knees or in a full plank position. Start with a low amount of repetitions and build from there. Begin with 1-3 at a time then add a few more push-ups each time. Try to work up to at least 10. Squats: To do a squat, simply pretend you’re standing up and getting in and out of a chair without the chair being there. Planks: To do this core-based exercise, lie flat on the floor and push yourself up into the top of a push-up position. Keep your hands and toes on the floor and hold your body straight like a table. Start by being able to hold the position. All of the little muscles in your back will turn on. It’s also important to activate your gluteus muscles as well. Hold the belly button in toward the spine and try to be as strong and stiff as possible. You can start with holding the position for five seconds and then rest. Then go for 10 seconds and rest. A great goal is to get up to a minute straight.